Our Essentials formula supports natural, powerful energy from the inside out. These capsules contain a comprehensive blend of probiotics, omegas, vitamins and minerals. Never before has such a complete powerhouse of nutritional "necessities" been assembled. This all-in-one pack has combined the key components of health, from powerful building blocks of nutrition, to cutting-edge products that promote health and wellness. This formula contains the following dynamic ingredients: Multi-VitaMin (Complex which includes more than 100 vitamins and minerals) Krill Omega (One of the most potent natural Pure Antarctic Krill/Omega oils on the market) Greens Complex (A "Power Punch" of greens, containing a perfect food combination) Vegie Zymes (Our complete vegetable enzyme complex created to digest all types of food) Adaptostym (The original Adaptogen formulation, fighting stress and improving health levels) Immu-Guard (Loaded with more than 43 botanicals designed to enhance immune function) Flora Norm (12- strain probiotic complex that supports immune and healthy gut balance) Toco Rejuve (Mother of all antioxidants, supports physical and mental well-being and supports slowing down the aging process) We removed the need to haul around eight different bottles of vitamins and minerals, replacing it with our single bottle of Essentials. 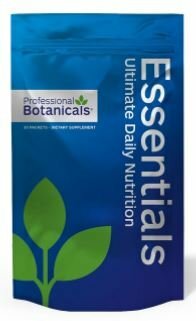 A handy and convenient way to ensure proper nutritional support, this formula supports your body's quest for optimum health.